There has been an increasing interest in the usage of natural products for the prevention and treatment of chronic diseases such as cardiovascular disease (CVD). Regular consumption of fruits, vegetables and whole grains has been shown to be negatively correlated with the risk of CVDs. These foods provide a diversity of nutrients and different bioactive compounds including phytochemicals, vitamins, minerals and fibers which play critical roles in the sustainability of optimal cardiovascular health. Plant-based foods or a nutritional cure are gradually being integrated into medical practice for CVD management partly due to the supporting experimental studies, clinical trials and epidemiological studies. These products have anti-oxidant, anti-inflammatory, hypoglycemic, hypolipidemic, hypotensive, anti-atherosclerotic, anti-thrombotic and hypocholesterolemic effects, depending on the dosage in cell and tissue cultures, animal models as well as in humans. 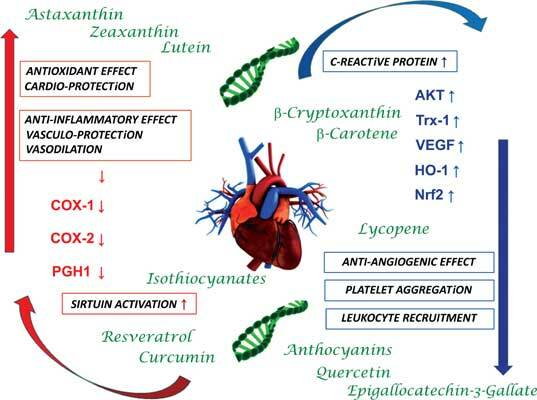 The present review considers some novel ideas on some major phytochemicals which have been suggested to have protective and therapeutic potential in CVD. The data presented in this work have been compiled from studies that have mostly been carried out in recent years. Keywords: Cardiovascular disease, cardiovascular pharmacology, molecular pharmacology, natural compound, phytochemical. Keywords:Cardiovascular disease, cardiovascular pharmacology, molecular pharmacology, natural compound, phytochemical. Abstract:There has been an increasing interest in the usage of natural products for the prevention and treatment of chronic diseases such as cardiovascular disease (CVD). Regular consumption of fruits, vegetables and whole grains has been shown to be negatively correlated with the risk of CVDs. These foods provide a diversity of nutrients and different bioactive compounds including phytochemicals, vitamins, minerals and fibers which play critical roles in the sustainability of optimal cardiovascular health. Plant-based foods or a nutritional cure are gradually being integrated into medical practice for CVD management partly due to the supporting experimental studies, clinical trials and epidemiological studies. These products have anti-oxidant, anti-inflammatory, hypoglycemic, hypolipidemic, hypotensive, anti-atherosclerotic, anti-thrombotic and hypocholesterolemic effects, depending on the dosage in cell and tissue cultures, animal models as well as in humans. The present review considers some novel ideas on some major phytochemicals which have been suggested to have protective and therapeutic potential in CVD. The data presented in this work have been compiled from studies that have mostly been carried out in recent years. Blockade of Renin Angiotensin System in Heart Failure Post-Myocardial Infarction: What is the Best Therapy?